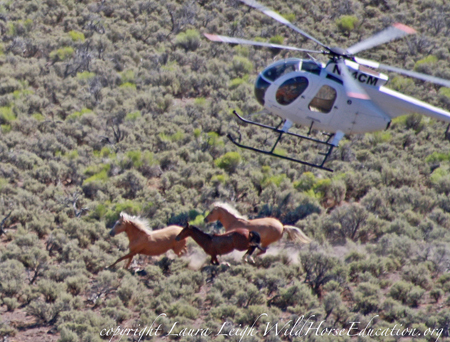 Above is an un-retouched photograph by Laura Leigh of our Miss Saffron (far right) and two young herd mates on the day they were brutally chased and rounded up by a BLM helicopter whose skids were barely ten feet off of her back. She was pregnant with Firestorm. The photo brings home to us more than just about anything else could how calloused and arrogant and without a soul these people are. 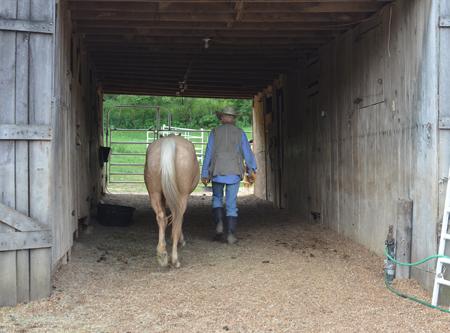 A few months later, after being shuffled from Nevada, to California, to Mississippi and hauled out to two local adoption events, we discovered how giving, and willing, and trusting a horse can be. That was the day we brought her home. It was one of the more special days of my life. Three days later she gave birth to Miss Firestorm. Twice Saffron had been shipped out out by the BLM to local adoption events, one in Kentucky and one in Florida. Neither time was she adopted. If any horse is passed over for adoption three times the BLM can then make an immediate outright “sale” of that horse for as little as $10. With normal adoptions the cost is $125 and the BLM retains the ownership title to that horse for one year, then follows up to assess whether the horse is being cared for properly before passing along ownership title. But with an outright sale the title passes immediately, and it has been documented that many if not most of those sales wind up going to kill buyers who transport the horses to slaughter houses in Mexico and Canada. If there is a rational reason why a horse’s life is suddenly devalued to basically zero because she has been passed over an arbitrary number of times I would love to hear it. This is some warped rationalization tangled up in a view that this life is worth spending thousands and thousands of dollars to save… unless she doesn’t get adopted right now. Then it’s worth nothing. When we met Miss Saffron on March 17th, 2012, she had only one strike left before she and her unborn baby would’ve been gone. Her third adoption event was scheduled for the afternoon of the same morning we met and adopted this most incredible trusting soul. And makes me wonder. How in the world, after all she had been through, could she meet us with such willingness? Give us the benefit of the doubt? Label us as innocent until proven guilty? And trust herself to open the door to trust? There was little question about her previous experiences with humans. She had just been rounded up, ripped away from her family, and moved across the country four times by an agency of the federal government who has proven repeatedly how little they care about wild horses. So our plan was to ensure that from first sight we were not equated with the enemy. Everything we did was from the perspective that whatever her problems might have been in the past, none of them were her fault. And they could all be fixed by proving to her that we were different from anything she had ever experienced. That we were not “that way”. Whatever “that way” happened to be. Which, of course, we didn’t know. So that meant we had to exclude everything. Which is why we spent 35 days doing absolutely nothing with Miss Saffron except to feed her, and be available. And, for 32 of those days, be sweet and loving to her new baby. Without any knowledge of the learning experience we were about to have we were trying to wipe her slate clean. To give her a fresh start. As if she had never before seen a human being. And then wait for her to choose, of her own free will, to trust us. We now know why it worked. As mentioned in the article my host, Nick Knight, put Kathrens up at his ranch on several occasions. He was rewarded with books and videos. I was able to watch some of the videos about Cloud whilst I was there. It very much enhanced the experience. She has done remarkable work. Though my time with the horses was very brief it left a big impression. I’m headed to the Blackfeet Reservation next week where I hope to watch and photograph the spring foals. 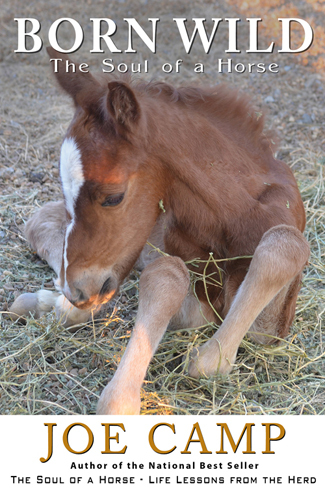 Nothing so sweet as a painted pony baby on the reservation. I do miss horses and horse people. I just published an article on my blog about the Wild Horses of the Pryor Mountains here in Montana. As luck would have it I then camec upon your blog. I know this stuff goes on at the Pryors too. And, it just rips my guts out. This is the article if you’d care to read it. Nice Kinsey. 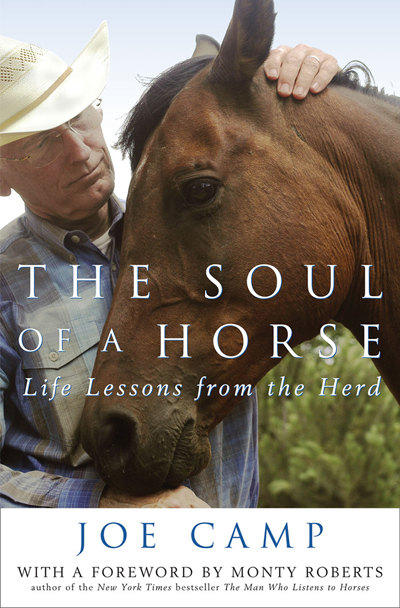 I assume you have seen Ginger Kathrens’ three PBS specials on the Pryor horses and the stallion she named Cloud and has been following for 16-17 years. Since she caught him on film the day he was born. Really good stuff.